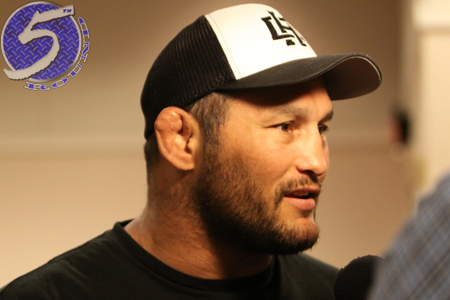 Being a 15-year mixed martial arts veteran, Dan Henderson (Pictured) has already been around the block and back when it comes to pre-fight banter. That’s why the former PrideFC and Strikeforce champ didn’t bat an eye when UFC light heavyweight king Jon Jones picked apart his game in a recent UFC 151 promo video. “It’s no secret that Dan Henderson is a little bit of a one-trick pony,” Jones said of his Hendo’s only shot at beating him. “My objective is to not get hit at all. It will be interesting to see how I handle one of those famous H-Bombs. During this week’s episode of FUEL TV’s UFC Tonight, Henderson addressed “Bones’” analysis, and he didn’t necessarily disagree with the youngster. “It must be a pretty good trick,” Henderson stated. “It’s kept me in the sport this long and people keep wanting to see it. It’s kept me around for a long time. Of all of Henderson’s past opponents, Jones is clearly the most dangerous he’s ever faced. He’s also the most hyped fighter he’s met. Henderson is currently a whopping 5-to-1 longshot against Jones, so hopefully the 41-year-old has plenty of H-Bombs at his disposal come September 1st.